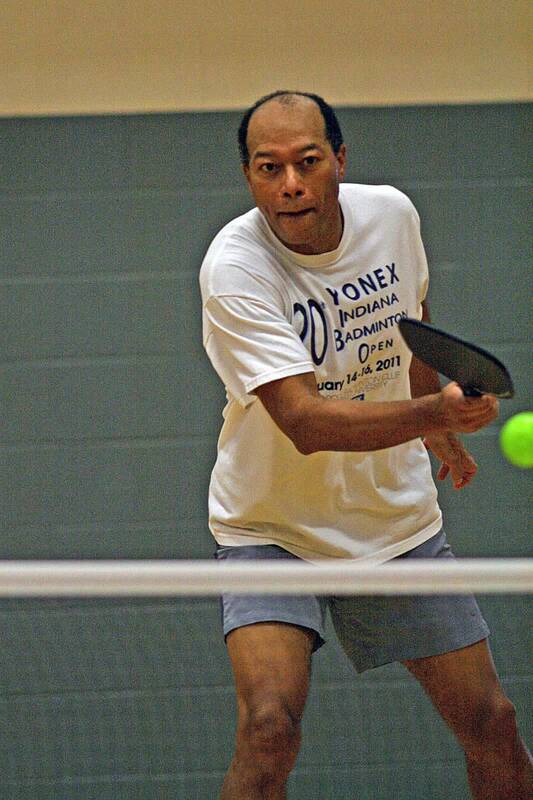 Rules/Strategy Review – Return of Serve in Doubles – Pickleball is Thriving in Northwest Ohio! Last month my post covered the basics and strategy involved with serving. Thanks to everyone who commented to let me know the information was helpful. This month I would like to give you some things to think about regarding return of serve. The number one goal on return of serve is to put the ball in play. I hear it said many times “the worst thing you can do in pickleball is to miss your serve”. Missing your serve is not a good practice, however, I would ask you to consider this question. Which is worse, missing your serve or missing your return of serve? I make the case that missing a return of serve is worse than missing your serve. When you miss your serve you only miss the “opportunity” to score. Every time you hit the return of serve out-of-bounds or in the net, your opponents get a point! Position to receive serve is also something to think about. In my opinion you should stand behind the baseline. A smart serving team is trying to hit their serves deep, not short. A short serve automatically brings the serving team to the net in a strong offensive position. The number two goal on return of serve is to get to the net. It is easier to win points from the net than it is from anywhere else. The return of serve is the one time that you can usually beat the other team to the net because they have to let the ball bounce before hitting it. One mistake to try to avoid is walking through your shot; players are anxious to get to the net after returning the serve and they quite often start moving their feet before they hit the ball. When you walk through a shot, you have a higher chance of hitting the ball either in the net or out-of-bounds. The third goal on return of serve is to avoid hitting a short return. A short return allows the serving team a better chance of getting to the net easily with a dink or to hit a power shot at you which will be increasingly difficult to return the closer they are to you. Remember goal two; the team that gets to the net first usually wins so try not to bring your opponent to the net by returning short. Most often a hard serve is the one you will return short because you didn’t have time to react. Short returns generally happen when we get “handcuffed” by being in the incorrect position to receive. If a player serves hard, position yourself a step or two behind the baseline so you have time to set up to hit a good deep return. Just be on your toes in case they do try to hit a short serve. This entry was posted in Skills & Drills. Bookmark the permalink. Marsha, thanks for your articles on serving and the return of serve. They are both very helpful. How about continuing with the next shot (the dreaded “third” shot) for your next article.? I find this to be one of the tougher shots to get a good handle on. Do you blast it, do you hit it soft, do you lob, etc., etc.??? What the heck do you do? This shot is different (and more counter intuitive) than most other third shots in the different racquet sports. Then how about the strategy you should be using when all four players are at the No Volley Line for another article? That is another tough one that I still have trouble with. Thanks again for the time and effort you put into this tips for the players.